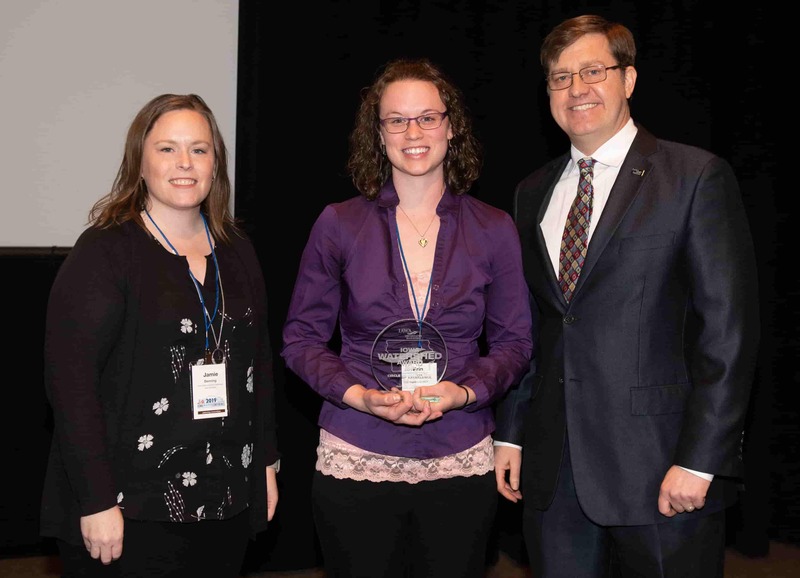 AMES, IOWA – Erin Ogle, watershed coordinator for the Taylor County Water Quality Initiative (WQI) Project, was honored yesterday with the Circle of Excellence award from the Iowa Agriculture Water Alliance (IAWA) as part of the second annual Iowa Watershed Awards program. Ogle was honored alongside four other watershed coordinators who also received IAWA Iowa Watershed Awards for their multitude of contributions and steadfast dedication to improving water quality across the state. Ogle was recognized with the Circle of Excellence award because of her successful convening of stakeholders and streamlining of common water quality, soil health, and sustainability goals. The Taylor County WQI Project began in 2016 and was recently renewed for phase two, which will take place over the next three years. Partners include Iowa Department of Agriculture and Land Stewardship (IDALS), EFC Systems Inc., Taylor County SWCD, ISU Extension, the Iowa Soybean Association, Iowa Corn, Green Cover Seed, NRCS, Practical Farmers of Iowa, Iowa Department of Natural Resources (DNR), Iowa Cattlemen’s Association, Iowa Forage and Grassland Council, Iowa Learning Farms, Hughes Feed and Supply, Weller Seed Supply, and the Taylor County Farm Bureau. Partnering with EFC Systems, the WQI uses the company’s web-based Profit Zone Manager (PZM) too to visually compare scenarios on fields to determine which practices, rotations, or land management changes will maximize return on investment for farmers and landowners. “They know the success of this project will not only benefit them now, but also their families and the next generation,” she explains. “I absolutely love what I do and how diverse my job is,” says Ogle. Her responsibilities include public relations to science-based research and working with private and governmental entities. To help maintain momentum for this work, Ogle will receive funding through the IAWA Iowa Watershed Awards to apply to the Taylor County WQI as well as funding for his own professional development. She majored in agriculture engineering at Kansas State University and has found her role as a watershed coordinator to be a perfect match.